Choosing from all the available bird baths can be tough. You can buy a stone bird bath or concrete one. There are heated bird baths and bird bath heaters for cold weather. 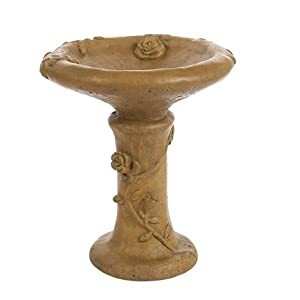 If you have a suitable shallow bowl you might just need a bird bath stand. These and other types come in lots of styles with different features and price tags. When you spot one you like, where should you put it? Is it best to go near your bird feeders? Should it be low to the ground or a few feet up? Do some work better for a particular bird species than others? The number of questions and concerns you need to answer may seem daunting. That’s where we come in. We have done the bird bath buying homework for you. Keep reading to get all the information you need to pick the perfect bird bath for your situation. Keep the following things in mind when choosing a bathing and drinking station for your birds. They will help you (and your winged friends) get the most out of your bird bath. Comfy Hour 11 Small baths need to be filled frequently, but they are easier to move and clean than larger options. Large bird baths can be heavy and hard to move. On the plus side, you don’t need to refill them as regularly as with a smaller bath. Large baths can handle multiple birds at one time, and are often more attractive to your larger feathered friends. Sometimes bigger is better, sometimes it isn’t. 2. What is the right bird bath height? Should your bath be high off the ground? Will you serve your birds better if it’s low to the ground? The answer depends on the types of birds you want to attract. Larger birds prefer ground-level baths. Smaller birds like to get up off the ground so they can see what’s going on around them. 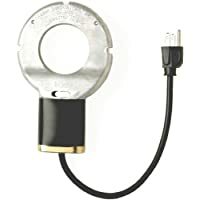 This helps them keep an eye on birds and other animals that may prey on them. 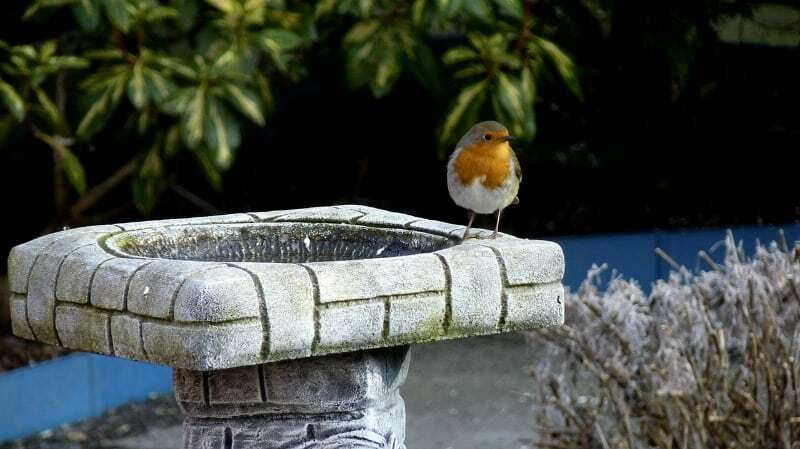 Pedestal bird baths are popular for attracting many common backyard birds. You might find a bird bath that is just the right size and fit for your situation. The price may be very attractive. But before you click that buy button, imagine the bath in your yard. Close your eyes and “see” it in your garden. Will it clash? Does it look like it belongs there? If you don’t like the look of your bird bathing and drinking station, is it really a good deal? Make sure the appearance matches the style and feel of your situation. Small birds need a narrow lip they can grip with their tiny claws. The lip size won’t matter to larger birds. 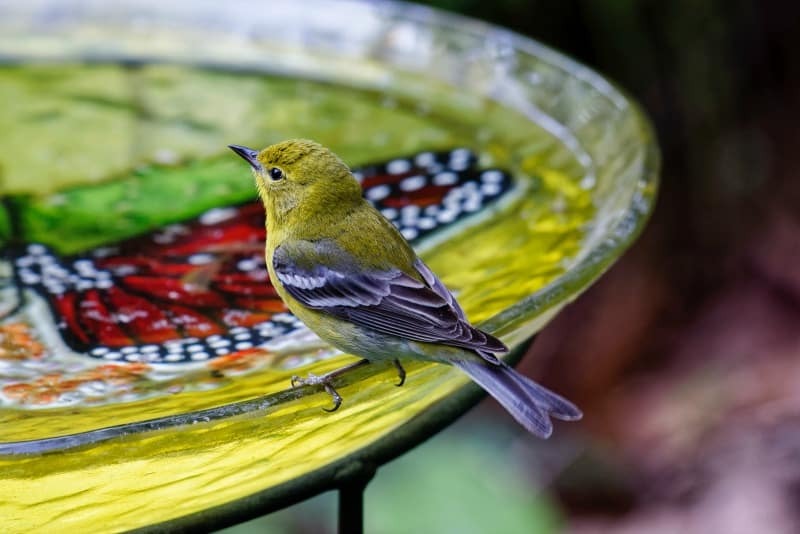 Choose a bird bath that has some texture and isn’t slippery. The best bird baths are not more than a couple of inches deep. You may want to choose a model with both deep and shallow sections. This works well for large and small birds that want to take a bath. You can place a flat rock in deeper baths to allow access for small birds. A detailed and complex bird bath might look pretty. It may even be stunning. Just remember that elaborate means harder to clean. Lots of nooks and crannies mean places mildew can hide. 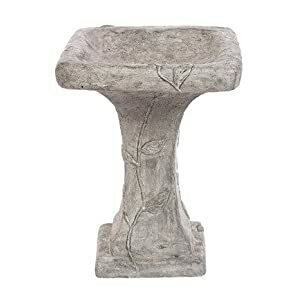 A stone or concrete birdbath may not be very fancy looking. However, it doesn’t need much maintenance and is easy to clean. 6. 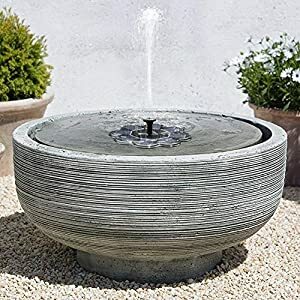 Does the birdbath promote moving water? TekHome 2019 1.6W Solar Birdbath Fountain, Solar Powered Bird Bath Fountain, Mini Water Fountains Outdoor for Garden Pond, Small Floating Swimming Pool Fountain, Solar Panel Pump, 4 Nozzles. Studies show that moving water will attract more birds. Still water just doesn’t look as attractive to birds as moving water. Choose a bird bath that includes a drip or mister. If your dream bath doesn’t include this option, is there some way you can attach a mister or dripper? Baths with bubblers and fountains keep the water moving. It is harder for mildew to grow in moving water. This can attract more birds, and it keeps the bird bath cleaner with less work on your part. 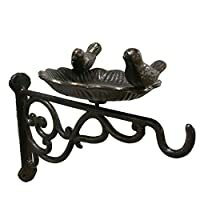 There are all kinds of bird bath sizes, styles and price ranges. Just about anything you can get to collect a couple of inches of water can serve as a birdbath. 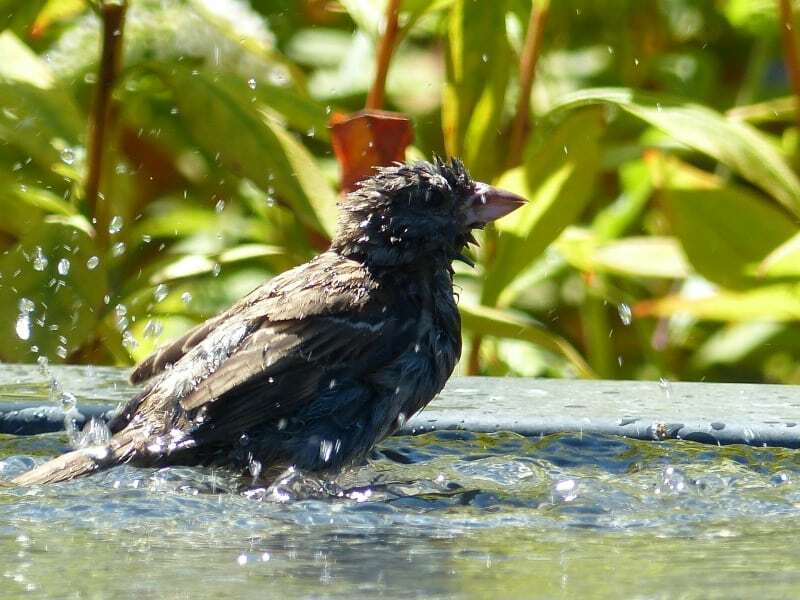 Let’s take a look at some common types of bird baths you might want to consider. Stone birdbaths can be heavy. On the plus side, they are durable. Stones are found in nature, so these types of basins don’t intimidate or scare birds. They look natural. If cost is a factor, a stone bath can be more expensive than some other options. Stone baths often look more at home in your garden and more natural than plastic bird baths. A heavy stone bath can cost a lot to ship. To combat this, a lot of sellers on Amazon offer free shipping on stone bird baths. A concrete bird bath is often mounted on a pedestal. These pedestal birdbaths can cost $100 or more. Just like their stone cousins, they are extremely durable and weatherproof. A concrete birdbath can truly last a lifetime. This means you don’t have to buy a new model every few years. Some concrete birdbaths are veritable works of art. These baths are perfect for smaller birds that like to drink and bathe a few feet off the ground. If you don’t want to spend much money, choose a plastic bird bath. These drinking and bathing stations are made in molds. Because of this, there are a virtually limitless number of shapes and sizes. They are lightweight and portable, clean up easily, and if you want to buy several baths, you won’t break the bank. On the downside, a plastic bird bath is not as durable as a stone or concrete bath. If you go plastic, choose a green, brown or stone-like color. This makes the bath look more natural to the birds you are trying to attract. A lot of people have standalone bird baths. The bath is in the middle of the backyard, and not near any flowers or trees. This is often the case with concrete pedestal fountains. Consider garden bird baths if you want to attract a lot of birds. These ground-level or raised bird basins have flowers, shrubs and trees nearby. You plant them right in the middle of your garden, thus the name. This gives birds a sense of security. They don’t feel like they are as vulnerable since they can quickly fly to a nearby shrub or tree. These are obviously a combination bird baths and built-in heaters. The power cord often runs through the inside of a pedestal base. This means no unsightly cords or wires. 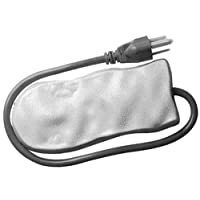 It also limits the possibility of a shock if wires get frayed over time. Birds need water that isn’t freezing cold so they can drink and bathe in the winter. Heated bird baths solve this problem. Consider a solar bird bath if you don’t want to fuss with electricity (and pay for it). 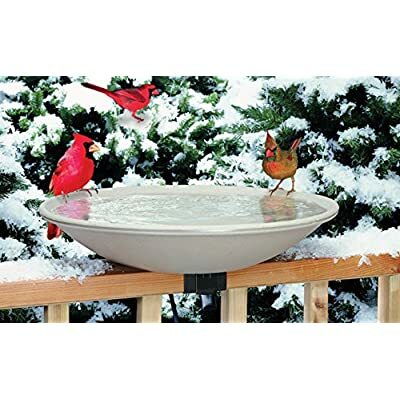 Bird bath heaters are great for cold weather climates. Your birds don’t have to deal with a frozen chunk of ice in the winter. They are there to bathe and drink, not ice skate! Some bird bath heaters have thermostats so you can select a specific temperature. Look for a model that is the same color with your basin, or one that can be painted a natural color. You are going to have to power your birdbath heater, and this means an extension cord or electric outlet. 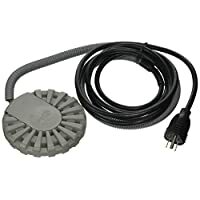 Some heaters are listed by their manufacturers as “deicers”. When shopping online, you may want to search for bird bath deicers or de-icers. There are a lot of considerations you need to make when you buy a bird bath. Some people just grab the first one they see. They figure they are all the same. We hope we have shown you why that you have choices. If you have something in mind and your local nursery or gardening center can’t help you out, the Internet is always a convenient option. You can choose the features, style, size and price range that are perfect for your situation, and your birdbath will be delivered to your front door. Shop in in the comfort of your home in your bath robe or pajamas. You don’t need to fight traffic only to find out the one you want is sold out. This means choosing the right bird bath is only a few convenient clicks away. Happy bird watching!